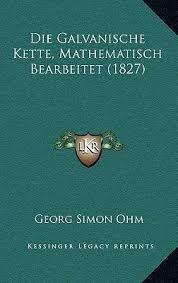 Georg Ohm Research Papers look at the creater of one of the most widely known principles of electronics, Ohm's Law. Georg Ohm research paper due and don’t know how to start it? How about like this? Georg Ohm (1789-1854) was responsible for the discovery of one of the most widely applied principles of electronics, Ohm’s Law. O’Connor and Robertson state that Ohm’s father, a locksmith, was a self-educated man and that he was able to give his two sons, Georg and Martin, competent instruction in mathematics, physics, chemistry, and philosophy, instruction which outshone the rote learning that they were exposed to at school. Georg Ohm entered the University of Erlangen in 1805, but did not concentrate on his studies. As a result his father insisted he leave the university after three semesters. In 1811 he returned to Erlangen and received his doctorate. There followed years of occupying humdrum positions in academia, years in which Ohm was not professionally satisfied and in which he was not well-rewarded financially. It was not until the last decade and a half of his life that he began to receive the recognition that his work deserved. Ohm’s work focused on electricity and was based on a then-new approach to physics that emphasized mathematics. His most important discovery was the definition of electrical resistance that is known as Ohm’s Law. Giancoli notes that “Ohm’s Law” is not really a law. He states, “If we want to call something Ohm’s Law, it would be the statement that the current through a metal conductor is proportional to the applied voltage…But this relation does not apply generally for other substances such as semiconductors, vacuum tubes, transistors…”. Because it applies only to metal conductors and is not applicable to large classes of other conductive materials, Ohm’s Law does not have the status of Newton’s laws of motion or the laws of thermodynamics which are far more universal in application. Nevertheless, a great deal of the electricity utilized for personal, commercial, and industrial purposes is conducted via copper wire and is therefore covered by Ohm’s Law. Paper Masters writes custom research papers on Georg Ohm and look at the creater of one of the most widely known principles of electronics, Ohm's Law.